Experience an exceptional indoor climate with the HealthLine series ‘HRC-300 balanced fans with heat recovery!’ Our design units come standard with integrated moisture sensor and water seal and are suitable for perilex, RF control and CO2 demand control. They can be configured as left and right versions and are equipped with an intelligent defrost cycle and bypass. Moreover, the products from the HealthLine series are lightweight, allowing them to be easily installed by one person using a supplied mounting frame. The new electronics and a new product composition offer you numerous additional possibilities in terms of control and ease of installation. The device can be operated both wired (perilex) and wireless. As a result, the device only has 2 versions, an execution for 300 mm3 / h and 400 mm3 / h. As standard, the devices are supplied with a perilex plug for operation with a three-position switch. This is easily replaced by the supplied cord with a protective earthing plug. In the display the installer or user reads “operation”. On this you can quickly see the status of the device. The filter light on the display informs the occupant when the filters need to be cleaned or replaced. In addition to the display, this message is displayed on the 15RF control. The HRC-15 is equipped as standard with a modulating bypass. Because the device has four temperature sensors, the device can optimally control the bypass. This benefits the comfort in the home. The bypass ensures that the house does not heat up in the summer by blowing in cool filtered air during the night. De-icing cycle Because the HRC is equipped with four temperature sensors and a moisture sensor, the device knows exactly when the changer may freeze. The defrosting program will take place at an optimum time through intelligent control. The appliance is equipped with an intelligent control system which ensures that it automatically ensures that there is enough fresh and filtered air. 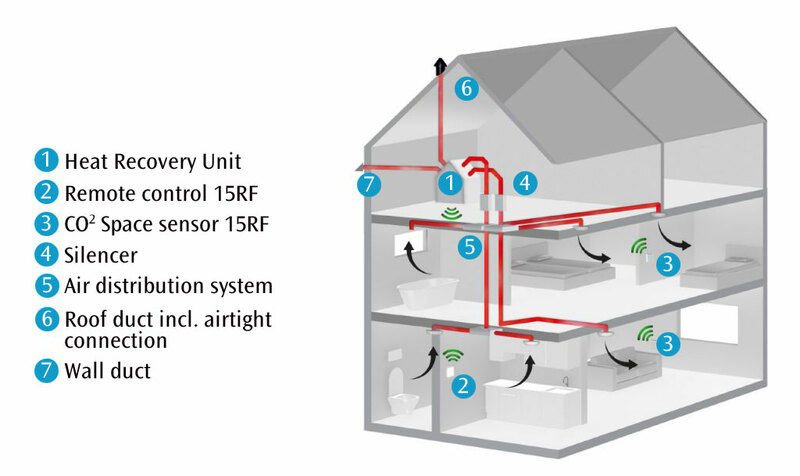 A moisture sensor, integrated as standard in the appliance, and optional CO2 sensors in the living room and bedrooms ensure the air quality in the home. Sufficient ventilation is of great importance for a healthy home. The HRC ventilates in the most comfortable way. In the winter it prevents drafts and noise from outside is reduced to a minimum due to the lack of window grilles. In the summer the HRC guarantees sufficient fresh air in the house, but more ventilation can always be provided by opening windows. The HRC ensures a comfortable, healthy and energy-efficient home throughout the year.